A new year is almost upon is. It's the time of year when the annual New Year's Resolutions kick into force. If they were all written down, I wonder how many of them we'd find had been kept. Probably not many. How about one in ten? Sometimes the resolutions can be pretty trivial - leaving 5 minutes earlier for work, drinking less coffee or cutting a few calories. Sometimes they're larger issues that really need addressing - bad habits, addictions or neglected callings. Why do we bother making these yearly pledges when our lives tell us that behaviour fails to follow intention? We seem to find something irresistible - almost magical - about the coming of a new year. And yet all that's changed after the fireworks fizz away is the final digit of the year. One number has been replaced with another and everything else remains entirely unaltered - including ourselves. Our habits, practices, relationships, hearts and lives won't be different at all. Of course, that doesn't mean that we're incapable of change, that everything in our lives has the remain the way it is. A new year can be a wonderful impetus to changing the way we live but ultimately it does nothing without our involvement. We have to want the change, and be willing to put the effort and measures in to bring it about. It's an uncomfortable truth that sometimes a little (or a lot of) manpower is needed from us. Is that it? Just try harder? History would tell us that, even with a genuinely enthusiastic attitude, we still fail. There must be an extra component. Jesus is troubled. In the garden of Gethsemane He goes off to pray and asks his bleary-eyed disciples to keep watch. They fall asleep. Three times. These are followers who, despite being eager and resolute, are stuck in a rut. Jesus is disappointed with them, but the first time He finds them asleep He doesn't just tell them to put more effort in. For Jesus, prayer is what's able to make the difference. 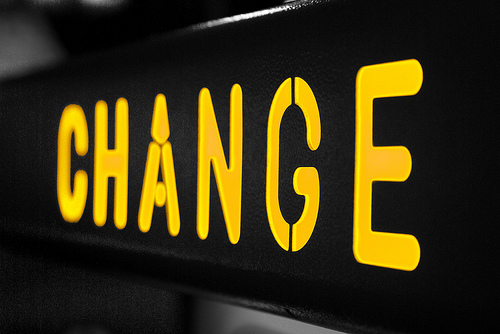 Often, it's only God's intervention and sustaining strength that can make change a reality. Naturally, that doesn't mean that we're not involved. It's called self-control, not God-control. It's the combination of our effort and God's sovereignty that changes the landscape of our lives. When it comes to the smaller things like losing weight it's up to us to put the effort in. When it comes to the bigger things we absolutely need God's help. I'm very much in the same boat as everyone else here. I'm a work in process too. And I, as much as anyone, need to master the art of continually surrendering the stubborn parts of my life to Him. As 2013 is wrung in, I pray that the areas of your life where you want to see change are submitted to Jesus' power and strength. That change comes as He works in your life to make you more like Himself. That when 2014 comes around the things you really struggle with would be a part of your history. 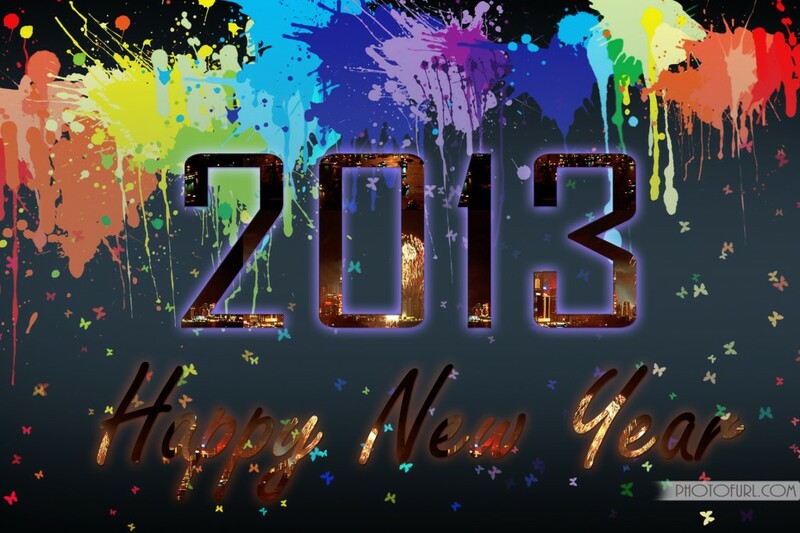 And have yourself a very happy new year. By now the dust has settled on the outcome of the Church of England's vote on women bishops. And there was quite a dust storm. The story occupied central attention on British news sites and provoked a lot of responses on facebook. Emotions in this debate run high on both sides of the table. Does it justify the furore? Let me say straight-off that this post isn't about whether it's right for women to lead or teach in churches or not. I'm not interested in adding to that discussion, mostly because I don't have an opinion on it. I'd need to read more on this issue in order to get one. What I do feel strongly about is the effect that this discussion has on the church, and on the way in which the church is perceived by the public. I'm immensely saddened by anything that divides the church. Jesus' prayer shortly before He died was that the church might be united as one community (John 17:21). My sadness on this issue is exacerbated by my view that it's been blown out of all proportion by both those inside the church and those outside it. I saw a lot of responses to the vote as the story broke. I saw responses from Christian friends on facebook and from non-Christians in the comments section of the BBC website. It seemed as if the people who were most upset were, firstly, non-Christians and, secondly, non-Anglicans. The loudest and most angry people seemed to be those who weren't actually affected by the decision but were disillusioned about a perceived lack of equality. But this wasn't a Church of England press release on the importance of women in general. It wasn't about making women second-class citizens. It was an administrative decision about leadership protocol in one denomination in one country. The reality is that, in the short-term, it was only likely to effect a dozen or so potential bishop-ettes. We really need a sense of scale here before we begin making wide-ranging, generalised comments about how the church relates to women. The issue gets clouded because we tend to overstate what being a leader means. In many churches the leader is idolised as the central source of authority. The one who always preaches. The one who meets people's emotional needs. The one with the responsibility for evangelism. The one who embodies what it means to be a Christian. The one (perhaps?) who can do no wrong. There are two ways in which we get seriously off-track if we have this mentality. Firstly, we place unrealistic demands on our leaders. It's vital that we remember that these are human beings, people who are trying to be disciples just like anybody else. They're not God. That's not to undercut their authority; churches undoubtedly do need responsible leaders who exercise power with a servant-heart. But when our respect for their position under God turns into idolisation then we need to take a reality check. Secondly, we believe that if someone wants to serve God then they have to go into full-time ministry and lead a church. Or go to Bible college and become a preacher. We fail to recognise the exciting diversity of the kingdom of God, that there are so many ways in which you can serve without leading or teaching. If someone wants to build God's kingdom then that's wonderful. It doesn't mean that they have to be a teacher or leader in order to do so. God wants women to build His kingdom. That's a theological no-brainer. We need to constantly keep this at the forefront of our minds in the debate over women leaders/teachers. It's only one form of serving. And if leading and teaching are, in actual fact, forms of serving, what does this mean for those who feel strongly about this issue? I'd suggest that it necessitates a strong dose of humility. Serving God is, essentially, joining with Him to accomplish His work. His work, not ours. There's a danger that I sound recriminating here against women who feel called to teach or lead, which is the last thing I want this post to achieve. But I wonder if we all, men and women alike, need a reminder that serving God isn't about jostling for position or promotion but about exactly that - service. If we're in-tune with God's priorities then we'll care more about the fruit of our service than about our role or function in it. So this isn't a big issue. It needn't be widened so as to become a statement of women's ability to serve God within the church, let alone an identity-statement about women's importance in general. Of course, in saying this I'm not seeking to deny the very real centrality of the issue for those women who do feel called to lead or preach. The process of seeking God's guidance here is undoubtedly an important one for them. I respect that and don't seek to cast any judgement on them whatsoever. Like I say, I don't have an opinion here yet. I mentioned at the outset that I was saddened by the way the church was presented in the popular press throughout this decision. I came across an article in The Guardian which argued that "the Church of England has detonated its credibility with modern Britain". You have to ask: what damages the church's credibility more (and here I mean the church as a whole, not just the CoE)? The administrative decision made by a church council or opinion articles criticising its judgement? I'm saddened that this issue has become such a big fish both in the church and in the press. The church (and, by extension, God) never seems to come out looking good. The same could be said for the debate on homosexuality. Perhaps the best thing we can do with this issue is attempt to keep it in our council meetings and off our newspages or facebook feeds, all whilst constantly striving for unity in the global church and showing grace to our brothers and sisters who see things differently. It's the film that everyone and their dog are going to see. Nine years after the concluding part of The Lord of the Rings trilogy was released, The Hobbit: An Unexpected Journey has hit the screens. 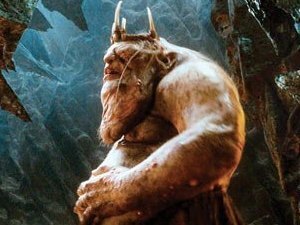 It's a film of orc armies, hobbits, wargs, gorging dwarves and a goblin king with a really, really big chin. What could such a mainstream blockbuster have to tell us about God? One of the pleasures of the film, for me, was witnessing the acting-out of a moment that Frodo and Gandalf discuss in The Fellowship of the Ring, where Bilbo is trying to escape from Gollum's lair. Gollum is in a furious rage because Bilbo has taken the One Ring. However, Bilbo is wearing the Ring, which (if you didn't know) makes him invisible. This gives Bilbo the perfect chance to sneak out of the cave. But he also has an opportunity - to blot out this murderous creature once and for all. Gollum, who has no idea where Bilbo is, is completely in his hands. Bilbo takes out his sword and holds it to Gollum's throat. I see myself in Gollum. I think any one of us can recognise ourselves in him. He's desperately attracted to something that's bad for him, something that he needs so much that it consumes his existence. Take it away and he feels empty. Give it to him and he's entranced, detaching himself from the world around him. The Ring stands for our selfishness. For that which consumes us. For our struggle to find meaning in this life. To give it a technical term, the Ring stands for our sin. Our Precious. 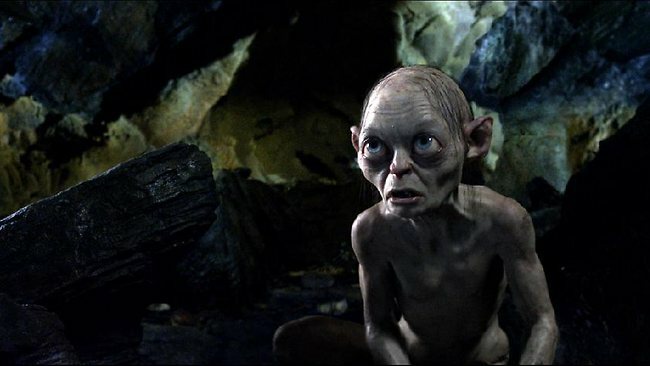 Gollum teaches us that, even as we recognise that the brokenness in ourselves is negative, somehow we're still attracted to it. We just won't let it go. GANDALF: He hates and loves the Ring, as he hates and loves himself. He will never be rid of his need for it. FRODO: It's a pity Bilbo didn't kill him when he had the chance. Bilbo sees something different. He finds himself in the position where he can kill Gollum and yet he shows him mercy. It isn't that Gollum deserves this mercy. Those big puppy eyes don't change who he is or the fact that he deserves to die. Yet Bilbo foregoes any concept of total justice in order to give Gollum a future. If we can see ourselves in the face of Gollum then in Bilbo we can see the face of God. The narrative in our heads is constantly telling us that God's out to get us. That He's desperately searching for some by-clause by which to condemn us. Or that, if He does show us mercy, then it's begrudgingly: 'Go on, then, if you must'. But God's mercy far outstretches Bilbo's. God doesn't just feel sorry for us; He actively desires to shower mercy on us that we don't deserve. We think God's the lawyer for the prosecution. Much to our surprise, we find that He's actually the barrister for the defence, who fights our corner and then pops round to the judge's platform and proclaims us as innocent. All purely out of the depths of His mercy. When you see The Hobbit (I'm sure you will), look out for this moment. And remember that God is the Father "who is full of mercy and all comfort" (2 Corinthians 1:3). * If you know almost anything about The Lord of the Rings, this isn't a spoiler. Don't worry. This isn't going to be a health and safety post about hazardous flag-carrying techniques. I'm interested in exploring how Christianity interacts with war. What was the last war film you saw (or the last fantasy/historical film with scenes of combat)? Think about the way in which these movies give you central characters that you relate to and empathise with. These characters then go and fight against figures who you, in the majority of cases, know nothing about. They're strangers, maybe shown as a silhouette or a mass group of targets. Have you noticed how we tend to root for the characters we've come to know? We want them to survive at any cost. And we feel good when they kill their opposition because it means that their side is winning. Where does this notion of sides come from? Often war gets covered in the idealism of nationhood. Being a soldier isn't just about fighting and dying - it's about fighting and dying for your country. How good a Brit, German, Russian (or elf!) you are is determined by your willingness to fight for the national cause. Objecting to a war makes you a damp squib who's lacking in patriotic zeal. Add another layer of 'fighting and dying for friends and loved ones back home' to this mindset and you have a reason to kill someone. Is it justified? For instance, in the rush of the war scene, do we ever stop to think that the gunned-down enemy soldier must have a mother that's desperate for him to come back safely? That he's got friends of his own? That he might have his own nation-driven agenda? I think that we 'other-ise' the enemy and make into 'the Other', someone who's so alien that the violence committed against him is deemed acceptable. Do we ever consider that he might be doing the same thing? Flags are dangerous because they can cause (or at least sustain) wars on the basis that 'the Other' has a different flag to you. A different nation. Or just plain different. There's an irrational hatred here that maybe doesn't have any obvious source. Perhaps it's more present in some wars than others. But we feel it, even in part, in something as innocuous as watching a film. It can't be good or healthy. I'm not naïve enough to think that there aren't situations where armed conflict is sadly necessary. But the endemic and seemingly endless extent of war across the world should surely make any sensible person question how much of it is really necessary. We need to be reconciled to our enemies and appreciate that they are fellow-humans. In the wisdom of Mother Teresa, "If we have no peace, it is because we have forgotten that we belong to one another." Where does the Christian fit into all this? I'm not going to pass judgement on the rights and wrongs of those who are involved in the military in different capacities. That's their call. But it's not enough to say that 'spiritual stuff' has no right to interfere with the political and the military. At the start of advent maybe it's appropriate to recall one of Jesus' titles - Prince of Peace (Isaiah 9:6). The least that you could say, in my opinion, is that no Christian should ever want war. One thing's for sure. There'll be no war in heaven. When Peace-King rules in fullness there'll be a wonderful melting pot containing "every nation, tribe, people and language of the earth" (Revelation 7:9). As God's ambassadors it's up to us to bring that reality about, starting now.